Design the outdoors with this contemporary Square Sofa & Chair Patio Set by CorLiving. Featured in our Textured Black Weave and accented with Dove Grey cushions this versatile set is perfect for all of your summer entertaining. Made with UV resistant resin rattan wicker, water repellent cushions and a durable steel frame this product is ready to withstand the elements of the outdoors. Transform the configuration to suit your needs. Design your space with this contemporary chaise and chair set by CorLiving. Featured in a soft linen fabric with wide arms and unique double stitched detailing, this set will make a designer statement in your home. The LZY-838-Z3 series is a comfortable sectional set made with a durable wood frame, quality fabric, and high grade foam filled seating. This set will give you years of enjoyment withstanding the test of time. Soundly constructed with solid wood and stained medium brown, this Leisure Season patio trash receptacle neatly keeps refuse or recyclables out of sight and has a pest-retardant lid to discourage vermin. It holds a separately-sold plastic bin up to 24-inch W x 24-inch D x 28-inch H and is outfitted with corrosion-resistant hinges and pull chains to ensure the lid does not flip over. A protective coating ensures long-lasting beauty and provides resistance to weather extremes. 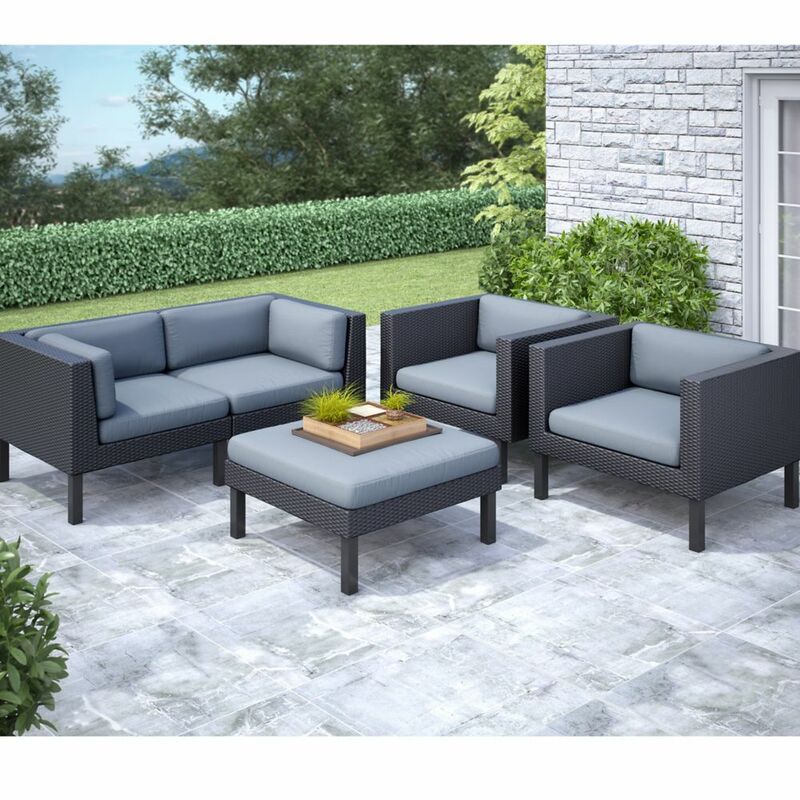 Oakland 5-Piece Patio Sofa and Chair Set Design the outdoors with this contemporary Square Sofa & Chair Patio Set by CorLiving. Featured in our Textured Black Weave and accented with Dove Grey cushions this versatile set is perfect for all of your summer entertaining. Made with UV resistant resin rattan wicker, water repellent cushions and a durable steel frame this product is ready to withstand the elements of the outdoors. Transform the configuration to suit your needs.